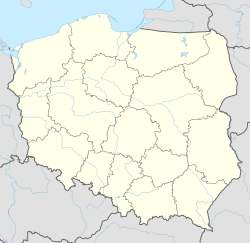 Olsztynek [ɔlʂˈtɨnɛk] (German: Hohenstein in Ostpreußen) is a town in Olsztyn County, in Warmian-Masurian Voivodeship of Poland. It is the administrative seat of Gmina Olsztynek. Olsztynek is located about 28 km (17 mi) south of Olsztyn in the western part of the Masurian Lake District, where it borders on the Prussian Uplands (Prusy Górne), part of the Baltic Uplands. Several decades after the subjugation of the Old Prussians, Hohenstein Castle was erected from 1351 to colonize the Sasna lands at the behest of Günter von Hohenstein, Komtur of the Teutonic Knights at Osterode commandry. A parish church was mentioned for 1348. Grand Master Winrich von Kniprode granted the surrounding settlement town privileges according to Kulm law in 1359. Olsztynek became the seat of the local administration within the State of the Teutonic Order. During the Polish–Lithuanian–Teutonic War, the 1410 Battle of Grunwald (known as the (First) Battle of Tannenberg in German sources) took place in the vicinity of the town, whereby the Knights suffered a historic defeat. In the succeeding fights, Olsztynek was seized and burnt down to the grounds, in order not to let it pass into Polish hands. quickly rebuilt afterwards, the citizens however had to face high taxes imposed by the Knights who had to refinance their contributions paid according to the 1411 Peace of Thorn. In turn Hohenstein became a member of the Prussian Confederation in 1440, opposing the authority of the Order's State, but returned to its rule already during the Thirteen Years' War in 1455. During the Polish–Teutonic War (1519–21), the town was occupied by Polish troops under Hetman Mikołaj Firlej, who confirmed the town privileges. Unlike the neighbouring lands around Olsztyn in the Prince-Bishopric of Warmia, Hohenstein remained part of the Order's State in Prussia, until the conversion of Grand Master Albert von Hohenzollern to Lutheranism in 1525, wherafter the town became part of the Protestant Duchy of Prussia, a Polish fief. During the Second Northern War it was plundered by Swedish troops in 1656. Since 1618 ruled in personal union with the Imperial Margraviate of Brandenburg as Brandenburg-Prussia, Hohenstein with Ducal Prussia was incorporated into the Kingdom of Prussia in 1701. In 1804 a fire destroyed 108 houses and the townhall. After the 1871 unification of Germany the town lay inside the German Empire. From 1903 to 1933 the Tuberculosis sanatorium Hohenstein for male patients operated in the municipal forest about 4 km north of the town center. In the beginning of World War I in August 1914, Imperial Russian Army troops occupied the region but were defeated by German Army forces under General Paul von Hindenburg and Chief of Staff Erich Ludendorff in the Battle of Tannenberg. The battle actually was fought from 27 to 29 August in and around Hohenstein, whereby 115 buildings including the town hall were demolished. However, Hindenburg urged to name it after Tannenberg to counter the myth of the "German" defeat in the 1410 Battle of Tanneberg (Grunwald). The town's reconstruction started during World War I with financial aid from Leipzig and was largely completed by 1920. The townhall was finalized in 1922/23. As a condition of the Treaty of Versailles, the League of Nations held the East Prussian plebiscite on 11 July 1920 to determine if the people in the southern districts of the East Prussian province wanted to remain within the Free State of Prussia and Germany or to join the Second Polish Republic. The plebiscite resulted in 1,780 votes for Germany and 20 for Poland. In remembrance of the 1914 battle a large Tannenberg Memorial was inaugurated here on 18 September 1927, and made the place of the burial of Reich President Paul von Hindenburg on 7 August 1934. In World War II parts of the premises were used for the Stalag I-B prisoner-of-war camp. The memorial was partly demolished by the German forces withdrawing from the Soviet advance in 1945, after Hindenburg's coffin (and his wife's) were removed, and completely demolished by the Polish government in 1949. A surviving lion is displayed in front of the Olsztynek town hall. Until 1945 the town, officially known as Hohenstein in Ostpreußen, was part of Landkreis (district) Osterode in the Province of East Prussia. In January 1945 it was occupied by the Red Army throughout the East Prussian Offensive. Later it was handed over to the Republic of Poland; the German population was expelled and the region was resettled with Poles, especially those expelled from territories of Poland annexed by the Soviet Union. In 1960 a memorial for the 1410 Battle of Grunwald was erected by Polish authorities. Aleksandr Solzhenitsyn describes the Battle of Tannenberg in his book "August 1914". ^ "Former Territory of Germany" (in German). 2017-11-12. ^ a b c Salm, Jan (2012). Ostpreußische Städte im Ersten Weltkrieg – Wiederaufbau und Neuerfindung (in German). Oldenbourg Wissenschaftsverlag. pp. 135 ff. ISBN 978-3-486-71209-4. ^ Jüttemann, Andreas (2015). Die preußischen Lungenheilstätten 1863 – 1934 (in German). Pabst science publishers. pp. 234, 236 ff. ISBN 978-3958531383. ^ Marzian, Herbert; Kenez, Csaba (1970). Selbstbestimmung für Ostdeutschland – Eine Dokumentation zum 50 Jahrestag der ost- und westpreussischen Volksabstimmung am 11. Juli 1920 (in German). p. 102. Wikimedia Commons has media related to Olsztynek.